Cardinal Luis Antonio Tagle, Archbishop of Manila, Philippines is an international driving force for justice and care for the most vulnerable populations around the world. He is the hand of help for the poor and suffering, a voice for the voiceless, and a face of welcome for the stranger. In short, he is the embodiment of Catholic social teaching in action. 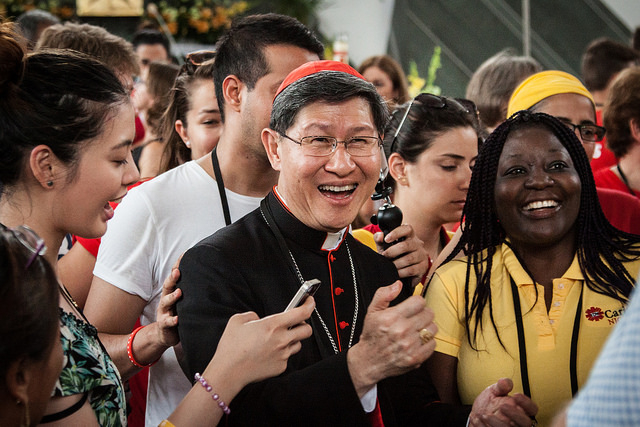 Cardinal Tagle was the first Asian to head Caritas Internationalis – a confederation of global charities, and the second youngest person to be named a Cardinal. 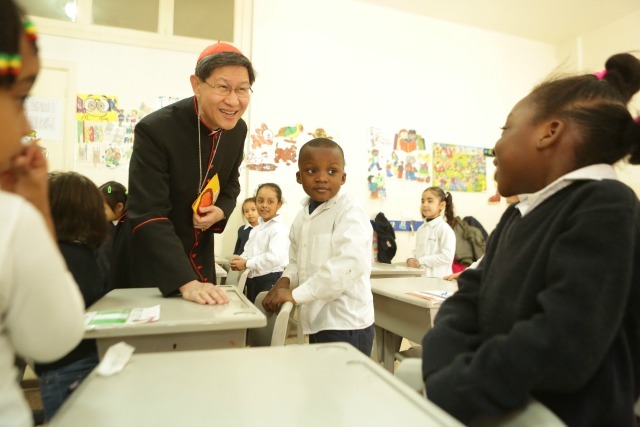 Standing at the helm of Caritas, Cardinal Tagle brings synergy and harmony to this network of over 160 Catholic organizations that work at the grassroots level in almost every country of the world, providing emergency relief, community development, and social services to all in need regardless of race or religion. Caritas Internationalis leads the Church’s Share the Journey Campaign on behalf of Pope Francis, and his Eminence states that the Share the Journey Campaign seeks to, “develop a culture of personal encounter with migrants. 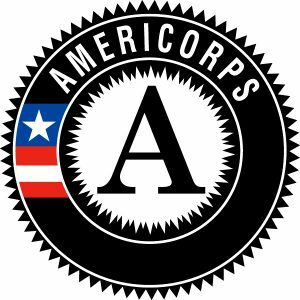 We need to move beyond abstract concepts and concern ourselves with real people”. This Campaign wants to give a human face to the phenomenon of migration. As President of Caritas, Cardinal Tagle drives the mission of this confederation to build a “civilization of love”, a better world for all, especially “the leasts”. These include refugees displaced from their homes because of war or disaster, those suffering from hunger and homelessness, victims of human trafficking and abuse, the sick with no medical care especially those suffering from HIV, TB and other catastrophic diseases, and those traumatized from the violence of war and civil unrest. Cardinal Tagle is known for his fierce human rights advocacy, including protection for the unborn. Born in Manila, “Cardinal Chito” as he is known to his flock, was raised in a devout Catholic family. As a child, he considered a career as a doctor. But, after spending time assisting his parish priest, witnessing the needs of the poor and the Church’s vital role in tending to those needs, 18-year-old Tagle felt called to the ordained life. Cardinal Tagle attended San Jose Major Seminary and was ordained a priest at age 24. He earned bachelor degrees in pre-divinity and sacred theology from Atenio de Manila University and Loyola School of Theology, respectively. In 1991, he completed a doctorate in sacred theology at the Catholic University of America in Washington, D.C.
Pope Francis recently appointed Cardinal Tagle to the Pontifical Cor Unum, which manages the Church’s charitable and humanitarian activities around the globe. Cardinal Tagle has observed that, “we need cultural intelligence for the sake of the Gospel and Humanity.” The Diocese of Camden’s Share the Journey pilgrimages are animated and informed by that observation. For his life commitment to the Church’s mission of promoting human dignity and spreading the Gospel, feeding both the physical and spiritual hunger of those in need, Catholic Charities of the Diocese of Camden honors Cardinal Tagle with its 2019 Saint John Neumann award. Cardinal Luis Antonio Gokim Tagle was born in Manila on June 21, 1957. After completing elementary and high school at St. Andrew’s School in Parañaque City, an establishment led by the CICM Fathers, he studied Philosophy at the Ateneo de Manila University as a seminarian of San Jose Major Seminary. He did theological studies at the Loyola School of Theology where he graduated in 1982. He was ordained to the priesthood on February 27, 1982, and was appointed associate pastor at St. Augustine Parish in Mendez, Cavite from 1982 to 1985, while he also taught Theology at San Carlos Seminary (Makati City), Loyola School of Theology (Quezon City) and Divine Word Seminary (Tagaytay City). He also held the positions of spiritual director at the Diocesan Seminary of Imus, Tahanan ng Mabuting Pastol (Tagaytay City), from 1982-1983, then rector of that Seminary from 1983 to 1985. From 1985 to 1992, he was sent to further studies in Sacred Theology at the Catholic University of America (Washington D.C.) where he obtained a Doctorate in Sacred Theology in 1991. In 1997, he was appointed member of the International Theological Commission of the Vatican. In 1998, he was an expert at the Special Assembly of the Synod of Bishops for Asia that took place in Rome. He also became president of the Commission on the Doctrine of the Faith of the Catholic Bishops’ Conference of the Philippines. In September 2001, at the request of the Congregation for the Clergy, he took part in a series of video conferences on the subject of ongoing formation of priests. He was appointed Bishop of Imus and was ordained to the Episcopacy by His Eminence Jaime Cardinal Sin, Archbishop of Manila, on December 12, 2001. Since he became Bishop of Imus, his activities have been as numerous as in the past. He travels throughout the country in answer to many invitations as a guest speaker. At the Synod of Bishops that was held in Rome in October 2005, he was elected member of the post-synodal Council and assistant to Cardinal Angelo Scola, general reporter of this Synod. Pope Benedict XVI appointed Tagle as the 32nd Archbishop of Manila on October 13, 2011, succeeding Cardinal Gaudencio Rosales. On June 12, 2012, Archbishop Tagle was appointed a member of the Congregation for Catholic Education for a five-year renewable term. He received the pallium from Pope Benedict XVI on June 29, 2012 along with several archbishops from various countries. Pope Benedict XVI named Tagle as one of the papally-appointed Synod Fathers for the 13th Ordinary General Assembly of the Synod of Bishops on the New Evangelization on September 18, 2012. 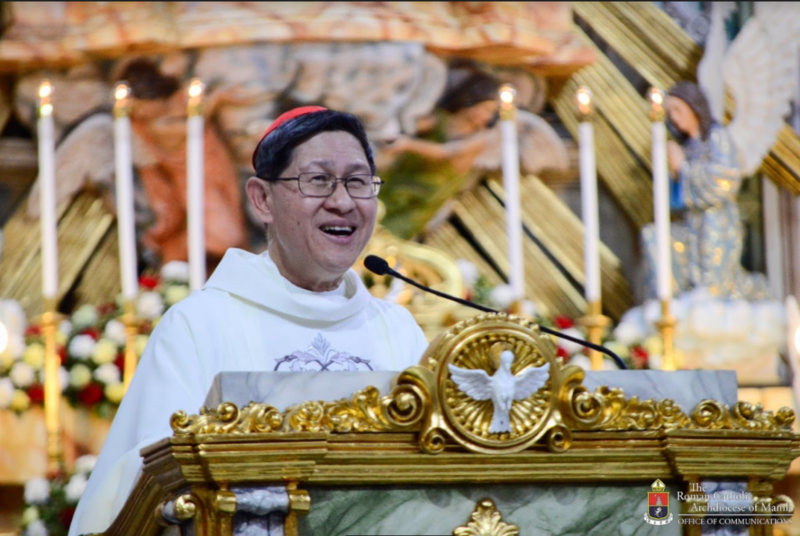 He then named Archbishop Tagle to the College of Cardinals on October 24. On January 31, 2013, Cardinal Tagle was appointed by Pope Benedict XVI to serve as a member of the Presidential Committee of the Pontifical Council for the Family and the Pontifical Council for the Pastoral Care of Migrants and Itinerant Peoples. He is also a member of the Congregation for Catholic Education, Congregation for the Evangelization of Peoples, Congregation for Institutes of Consecrated Life and Societies of Apostolic Life, Pontifical Council for the Laity, and the XIII Ordinary Council of the Secretariat General of the Synod of Bishops. On July 11, 2015, he was made a member of the Pontifical Council ‘Cor Unum’. He was also confirmed by Pope Francis as President of the Catholic Biblical Federation on March 5, 2015. On May 14, 2015, he was elected President of Caritas International replacing Cardinal Oscar Rodriguez Maradiaga.